Aalborg OC-TCi is intended for steam production. The high-performance Aalborg OC-TCi is a space saving combination boiler fired with both oil and exhaust gas. 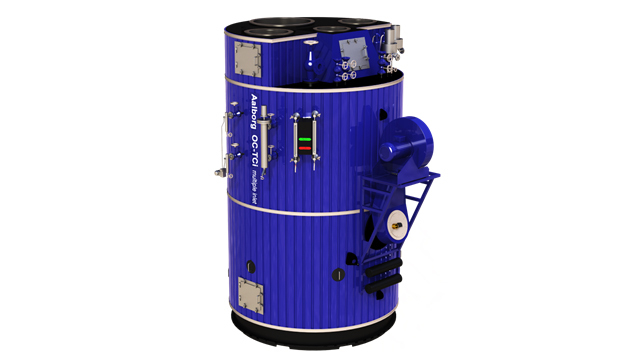 Aalborg OC-TCi is intended for steam production, the high-performance Aalborg OC-TCi (formerly MISSION OC-TCi) is a space saving combination boiler fired with both oil and exhaust gas. Preassembled and installed vertically, it consists of an oil-fired module with helix tubes and an exhaust gas fired module with smoke tubes. The boiler provides effective self-cleaning, thanks to its built-in TCi (Turbo Clean, intelligent) technology and its relatively high gas velocity compared to other composite boilers. Controlled via an Aalborg Control Touch (formerly MISSION Control Touch) system, it can be fitted with a compact silencer to suit any type of diesel engine. Aalborg OC-TCi is a vertical boiler with an exhaust gas section consisting of smoke tubes. The oil-fired part consists of a furnace, steam space, and the convective section, which consists of helix tubes with a turbo cleaning effect, wherein the flue gas flows. The boiler pressure part is manufactured from mild steel able to withstand high temperatures. transfer efficiency and reduced fouling of convection surfaces.